Soho. 1960-something. The Colony Club. Hazily drunken escapades with a dreamteam-esque artistic collective whose members include Lucian Freud, Francis Bacon, John Deakin. Undoubtedly up there in the top 5 moments in history someone with my artistically hedonistic curiosity would gleefully type into a time machine should I one day stumble upon one. Artists and actors, debauchery and creativity. Sounds sublime. But, as one member of this in-crowd was to discover, extreme high times such as these can soon be a fast track to the very low. Today, at 73 and having battled alcoholism and drug addiction for many years, artist Peter Roland-McLean is now clean and in recovery with the continued support of both AA and NA. 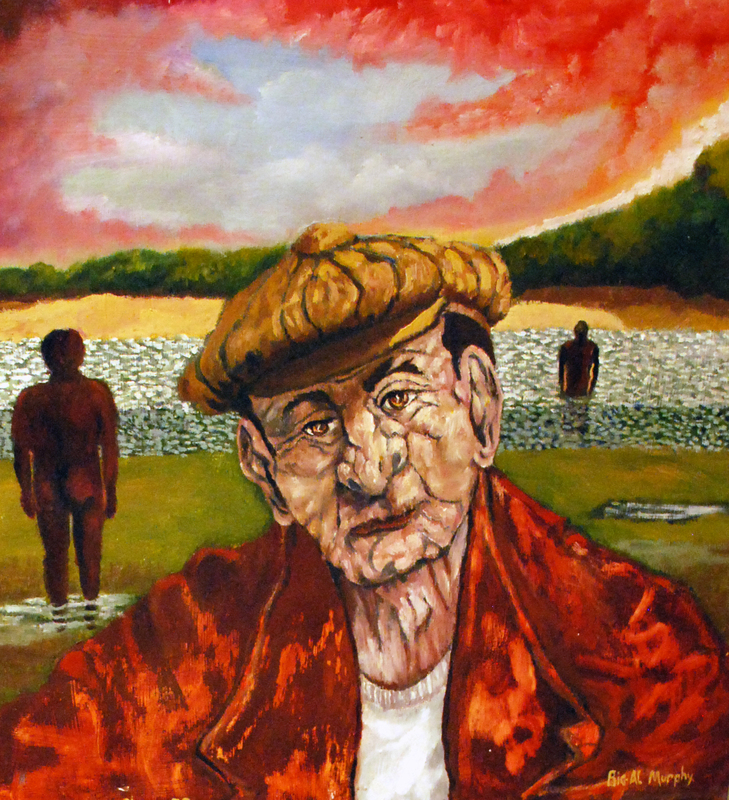 Living in Greenhithe in Kent, most of his time is spent immersed in a world of oil and memory within his studio/bedroom, with an eye-catchingly beautiful auburn cat named Mr Ben as assistant, a chatterbox the artist confides is ‘sometimes a bit of a bully’. 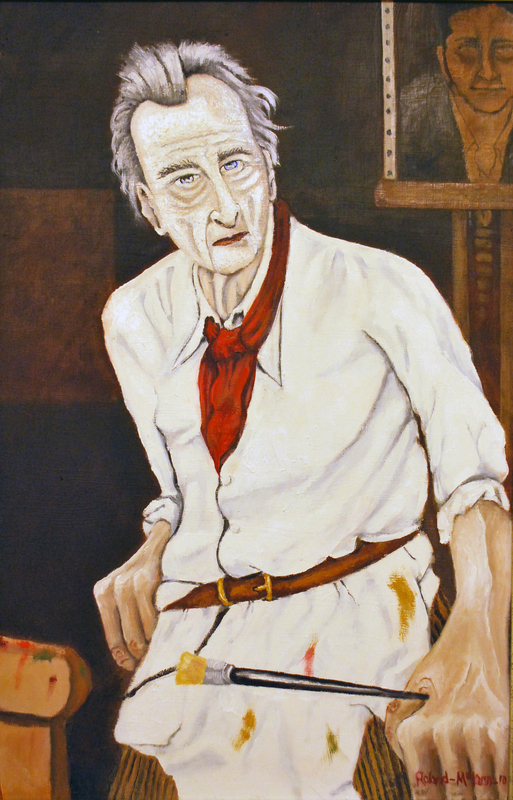 Contemporary, student and friend of Lucian Freud, Peter has produced a number of portraits of the renowned artist; a significant influence not only in his work, but throughout his life from their initial meeting at Camberwell College in 1958 up until his death in 2011. He speaks of Freud fondly, a mischievous twinkle in his eye as he recalls how they ‘talked about art and the situations we’d get into through the boozing’. 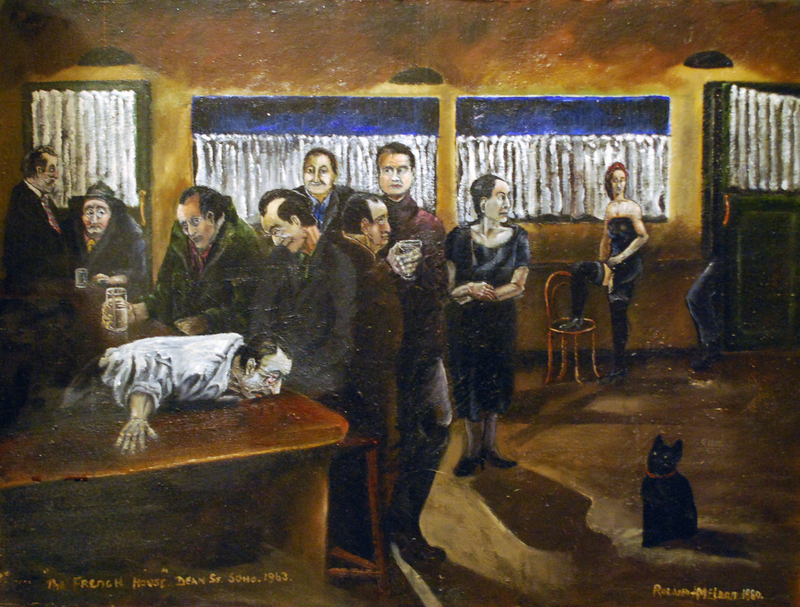 Although hints of Freud’s impact can be detected, the stylistic uniqueness of Peter’s works and the skillful ability to infuse a scene so deeply with hypnotic dynamism is all his own. With a father who spent 22 years in the army, Peter, at 18, found himself undertaking an unsurprisingly disastrous period of national service. With artistic temperament rarely well-received in a disciplinary setting, he synopsises the experience as ‘some idiot shouting at me’, a sentence I can entirely imagine myself uttering in the same circumstances; “There were some things so ridiculous they were telling me to do. I said hang on a sec, you can shout as long as you like but I’m not doing it. So in the end they said I was crackers and discharged me, which was the best thing that happened to me in the army”. At this point – 20 years old and acutely aware of his passion for painting, “the only real interest I had was all-consuming really, it was painting and drawing. I just knew, right from the beginning”, he joined Camberwell College of Art on a three year Fine Art course under the tutelage of an as yet relatively un-recognised Lucian Freud. They became friends, both in and out of the college surroundings, and Peter was soon part of the fashionable clientele drinking regularly at The French House on Dean Street and the legendary Colony Room fronted by the infamous Muriel Belcher. Francis Bacon was a customary fixture at the bar, with one of his most well-known paintings being a portrait of its afore-mentioned matriarch. It was around this time that Bacon’s work was beginning to seriously take off and his philosophy on material and media left a lasting imprint on Peter’s work; “Bacon used to talk about the accident. I look for that sometimes and if it happens, I don’t take it out. 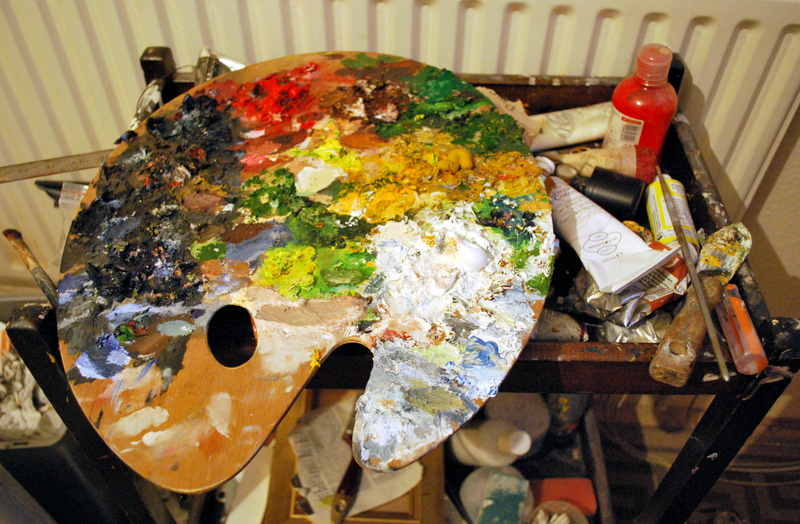 Oil paint; It’s magic, you can work it in, you can push it about, do wondrous things with it. Sometimes I’ll be that engrossed with the painting that I’m not really looking at the palette and I put the brush in the wrong colour and put it on. I’ll leave it on. I have this idea that it’s meant to happen”. 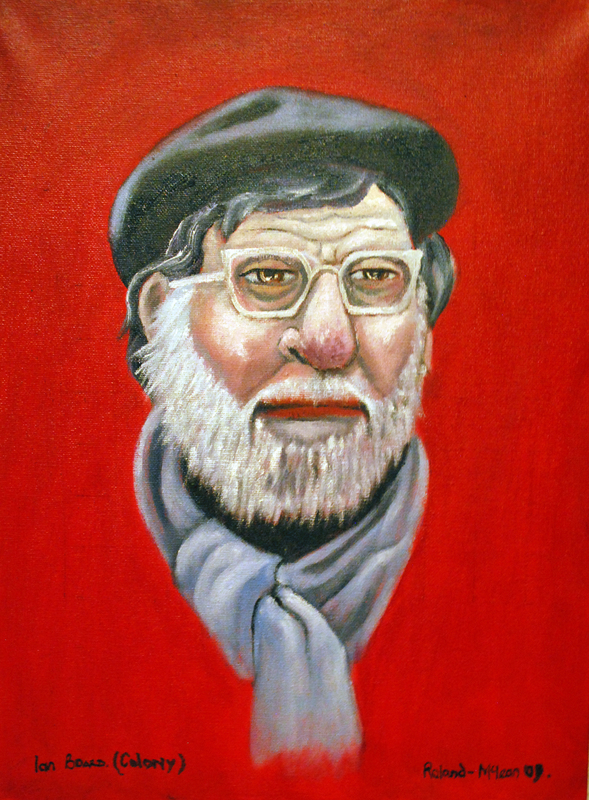 The 60’s Soho scene was infused with alcohol and drugs; Bacon and Freud themselves were heavy drinkers and others in the group gradually became seriously dependent. 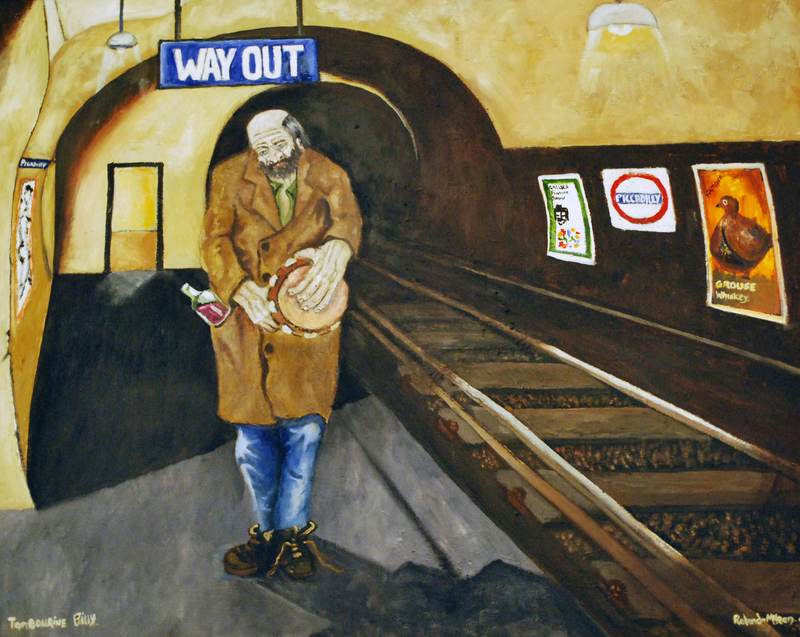 Peter’s artistic output became less substantial, with frequent intoxication affecting his creative abilities and subsequently his general daily life. He soon became homeless and spent a significant amount of time living on the streets of Central London, experiencing the harsh realities of a life of drug dependency. Through reflection and documentation of his past life experiences, Peter draws his subject matter from his memories, building emotionally charged scenes on canvases thick with deeply worked oil; ‘I can’t handle acrylic, it makes me feel sick’. 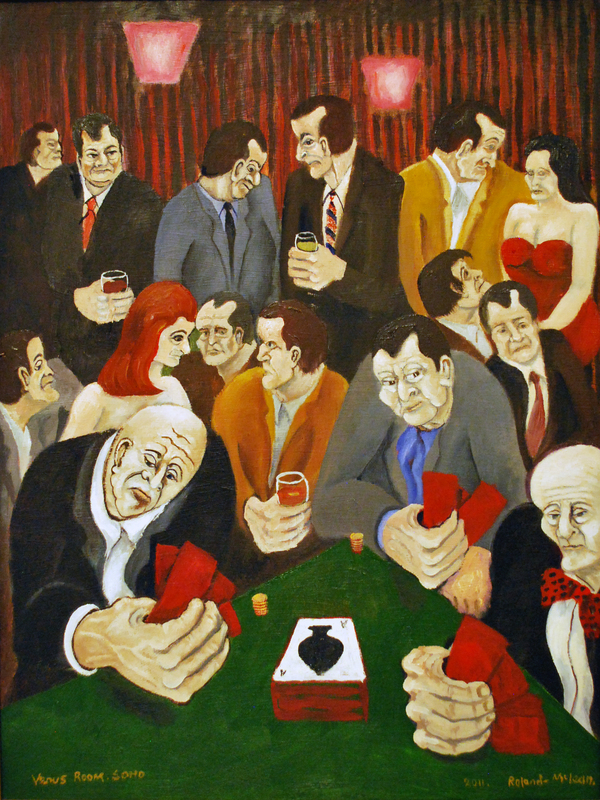 Whether inhabiting the smoky rooms of the French, propping up the bar at the Colony Club or disappearing into the shadows of St Martin’s, the characters dominate the composition; enlarged extremities draw the eye, expressive countenances carved like fleshy rock stare confrontationally out at the viewer. Peter confirms that these are true representations of those who frequented the clubs, there’s ‘Gypsy John, he’s an old Romany fellow, used to drink in the graveyard up at Southwark’ or ‘Tambourine Billy, who used to bang the tambourine down the tube. 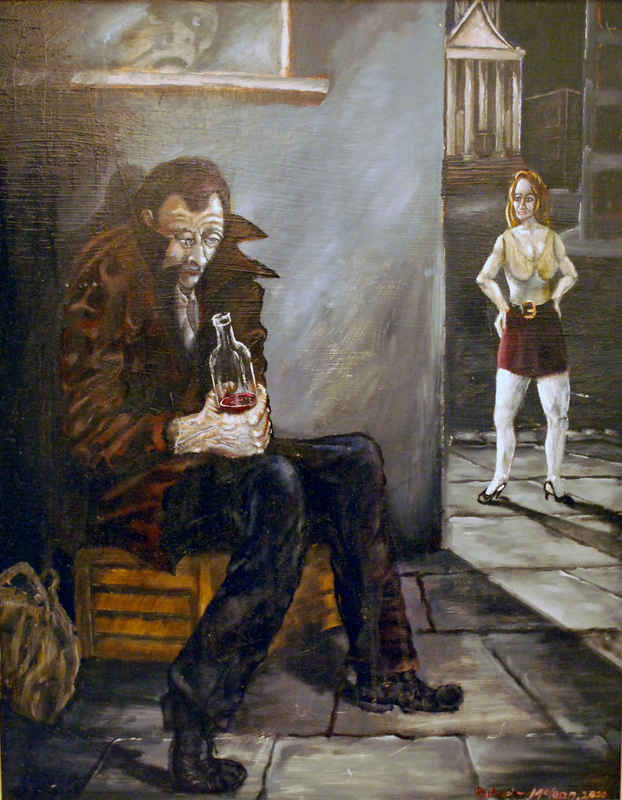 People would give him pennies, but he still had enough at the end to get a bottle of wine or something’. 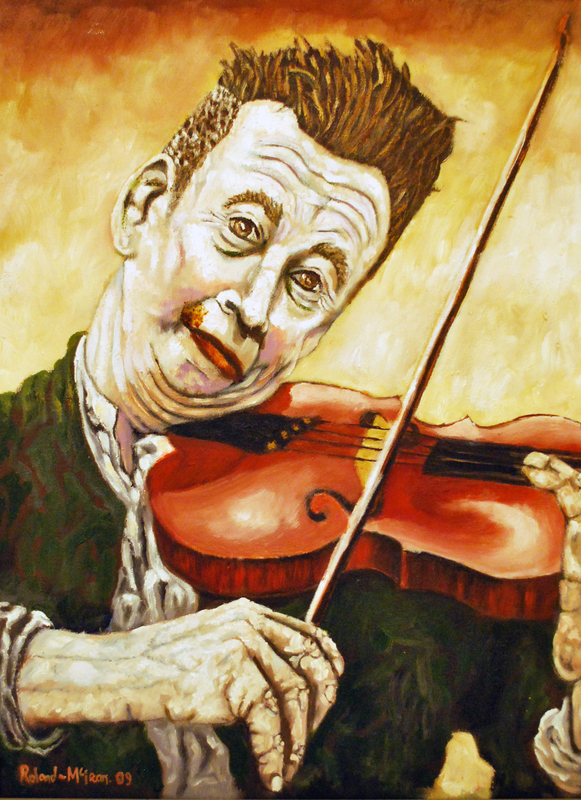 Others document well-known characters such as Amy Winehouse or Nigel Kennedy, ‘I liked him because he’s mad as a march hare’, whose maniacal glance shoots from the canvas whilst he plays his violin, exaggerated hands dominating the foreground. Most viewers of Peter’s works will notice the way in which his brush renders the human hand; a recurring theme in almost all of his pieces. The emphasis on these extremities and their often disproportionate size is not, as I initially guessed, indicative of menace or violence, a tool to accentuate the unsettling overtone present in the scenes, but instead the manifestation of his feelings about how we as a society take hands for granted. Hands, he says ‘are so important and yet people don’t pay much attention to them’. Despite the clear and vast differences in their works, Peter and Lucian have much in common, an affinity not only for paint and the beauty of art, but a kindred zest for excess and enjoyment, an embrace of the risque which ignites their work but would take its toll on the rest of their lives. 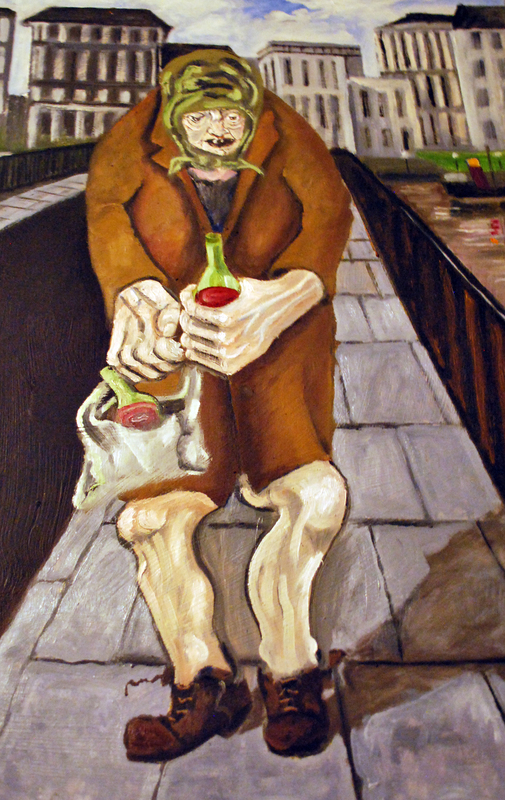 ‘If I drink again, I’ll die’ he tells me, yet is equally pragmatic about how lucky he is to still be here, to have the friends and companions he has and to still be painting. 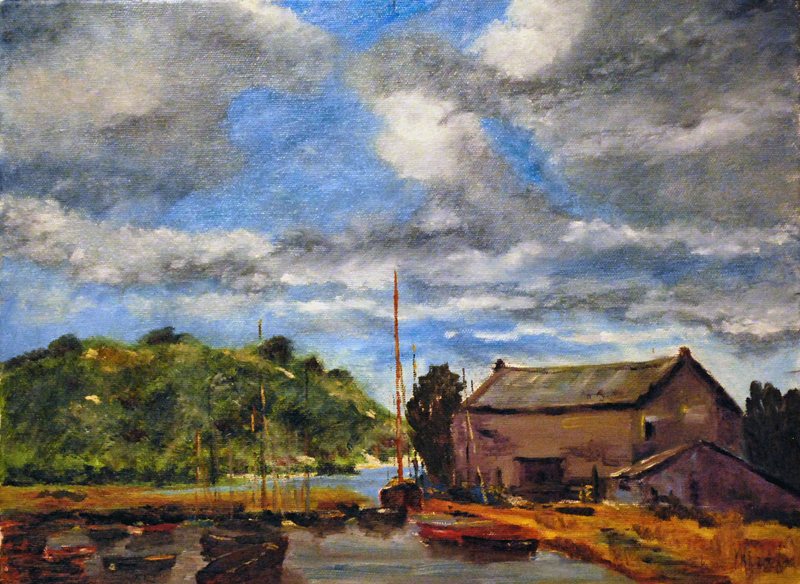 Throughout his life, in spite of the ups and downs, his desire and instinct to paint remains constant, an inherent necessity rather than a choice. He is a natural born painter, a fact recognised early on by Freud, who told him off the record that he did not need to be tutored, he knew exactly what he was doing. 54 years later, it’s clear that he still does. For information about the upcoming exhibition follow me on Twitter (@artexplorer434) where I will share details when they become available. A pleasure to read this post this morning. An introduction to a painter I’ve never heard of, who was an associate of two of my favorite painters, and a generous sampling of good-quality images of his work. The very readable text brought it all together. 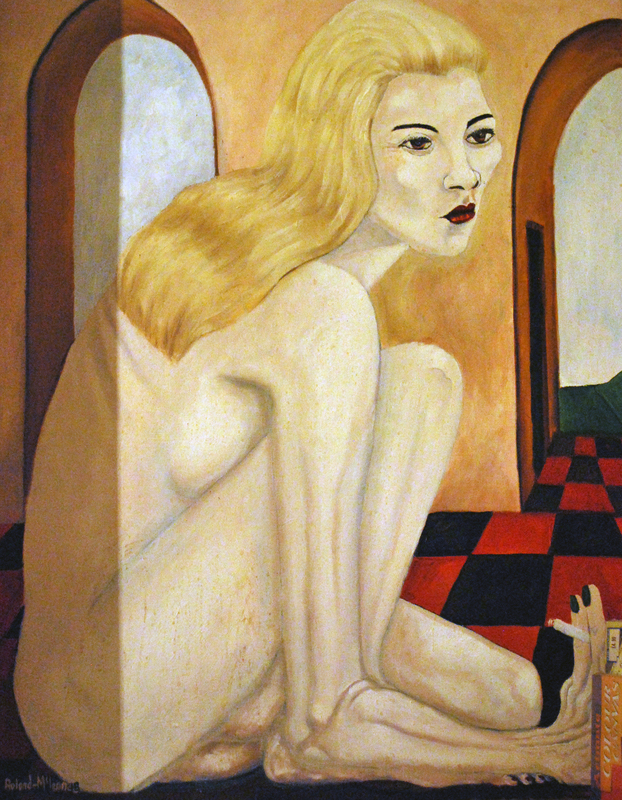 However, Peter Roland-McLean’s work is not anywhere near the caliber of that of Bacon or Freud. 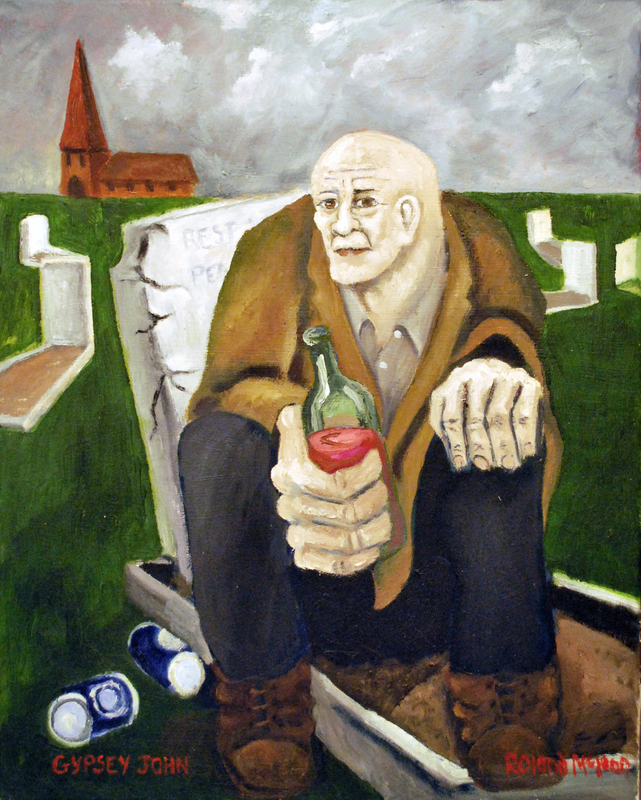 His work is amateurish and clumsy, even if the subject matter combined with the execution (both signaling the devastating effects of alcoholism) have a certain synergy that gives them poignancy. Contrary to all his assertions, he probably could have used a bit more training early on, IMO. Nevertheless, it’s a very good story and I’m guessing that some of his best work is his more recent, and look forward to seeing whatever he produces next. Hi Eric, Thanks for the comment and for reading, glad you enjoyed the post! I have to disagree however, with your point about quality. Style is utterly subjective and I personally don’t believe that in art there is such a thing as ‘amateur’. Folk art could well be seen as amateur, as well as outsider art, yet is equally valid as a form of expression and often just as/or more, arresting and affecting. 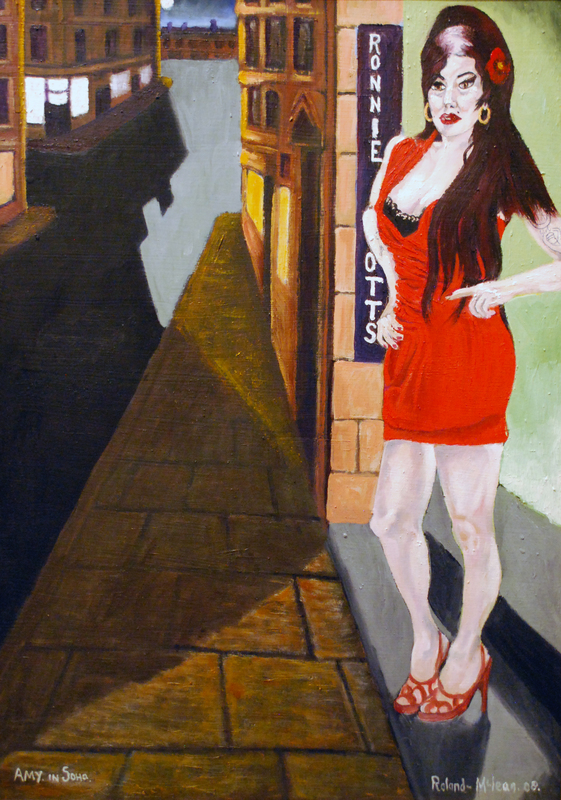 I know that many artists would argue they need to be distinguished from amateurs in order to make a living selling their work but I personally don’t believe art can ever be judged to be ‘good’/’not good’. Whilst studying art history at university I came across a lot of people who thought they were qualified to decide the difference. I strongly believe they are wrong. A piece of art which to me is beautiful is to someone else utterly unattractive; my mum, for example, thinks Freud’s work is vile, whereas I find it fascinating. She does in fact prefer Peter’s work! Therefore, to her, the technical ability which is of importance to you as a viewer, is not important to her as a viewer, yet both your opinions are valid. Technical ability – whatever that means? The ability to produce something accurately representative of how it looks in real life? – does not make an artist’s work better or worse, just perhaps different, or perhaps just the same. Freud advised Peter that art college doesn’t actually teach you anything, as art cannot be taught (as a teacher I’m sure you would disagree!). Different techniques can be taught, as can the history of known artists, but if you are already able to express yourself in a manner you feel works for you, then you could argue that it would not necessarily benefit certain people. Right, on some level all art appreciation is subjective and relativistic. Most my students prefer K-Pop (Korean commercial pop) to any of the music I love, and I prefer obscure Progressive rock bands like Gentle Giant over Michael Jackson. I am in the minority there, as he has the highest grossing record of all time. Also, keep in mind that Bacon and Freud are, in my opinion, two of the absolute best painters of the later 20th century. You might as well say that Braque is better than Picasso. Sometimes I agree that a less polished technique or over-the-top display of skill trumps mere virtuosity. I prefer Frida Kahlo over Diego Rivera any day. Van Gogh’s early work often had embarrassing perspectival mistakes, but he managed to find a balance between his ability as a draughtsman and a painter that worked spectacularly. I certainly prefer Van Gogh over his contemporary, Beaugureau, who could paint very realistically and was the golden boy of the Salon. You could say though that I am an artist’s artist, because I do appreciate a complex composition and rich, sumptuous color. I like to be challenged and stimulated. 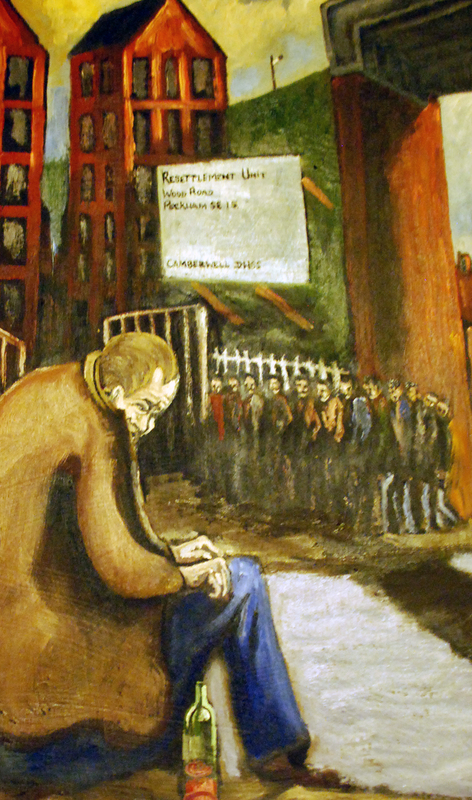 As artistic achievements, some of Bacons and Freud’s work is shocking, it’s so powerful. I don’t get any of that with Peter. But he is much more accessible, and may be more appealing on an emotional level. So, one person loves the Rolling Stones and another Beatles. If someone says the Ramones are better than Led Zeppelin I’m going to wonder what the hell is wrong with them. We all have our different likes and dislikes, I maintain that Peter Roland-McLean’s paintings don’t belong in the same room as Bacon’s or Freuds, but, of course, others will disagree. That’s probably a very good thing. 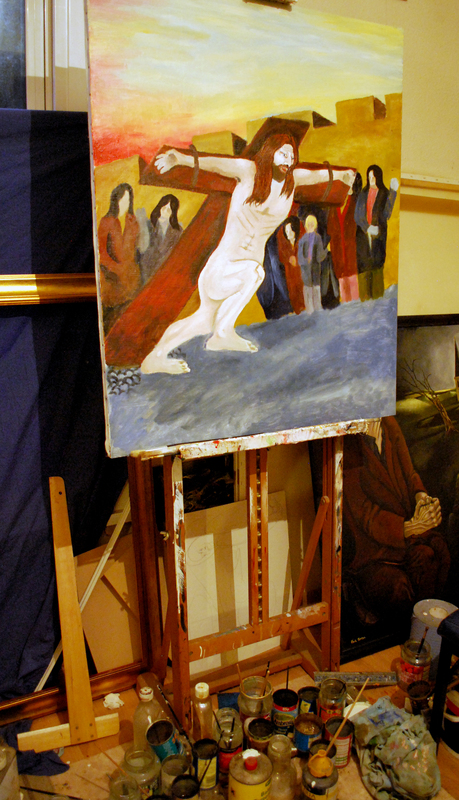 I do like his paintings though. It’s an interesting and vaguely optimistic angle. Anyway, I realized after I shared it that it might seem to continue the argument, but I didn’t intend it that way. I just came across it via a really very funny and interesting art blog, and thought it was apropos to share it. The funny blog is here: http://careersuicideblog.wordpress.com/ If you don’t know it, it’s really worth checking out. Yeah, I regretted writing “argument”. Cheers.